Dennis Uy, a Davao-based business tycoon and one of President Rodrigo Duterte’s biggest campaign contributors in the 2016 elections, is one step closer to becoming the operator of the country’s third major telecommunications company. Mislatel Consortium, which is composed of Uy’s Udenna Corp. and Chinese-state owned China Telecoms, was provisionally named as the country’s new major telco player during the government’s selection process done on Wednesday, November 7. This comes after the inter-agency committee tasked with the selection process disqualified two other companies that submitted bid documents, namely Philippine Telegraph and Telephone Co. and TierOne Communications International Inc., due to incomplete requirements. The latter company is backed by former Ilocos Governor Luis “Chavit” Singson. These three companies were the only bidders to submit their documents to the National Telecommunications Commission (NTC) office in Diliman, Quezon City—way below the 10 companies that purchased the Php1-million bid documents from the Department of Information and Communications Technology (DICT) over the previous month. Perhaps one of the most controversial companies that pulled out from the bidding process is publicly listed firm NOW Corp., which even raised Php1 billion through preferred shares in July priced at Php100 apiece. 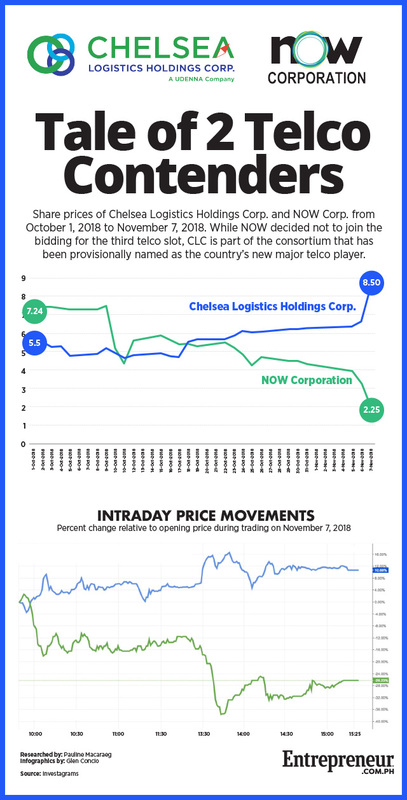 In the infographic above, we compare the share prices of NOW Corp. and Chelsea Logistics Holdings Corp. (CLC), Uy’s listed holding firm and a wholly owned subsidiary of Udenna Corp. over the previous month, or when the bidding documents first became available for purchase. Both companies were trading smoothly prior to the sale of bidding documents on October 8, with NOW Corp.’s Php7.24-stock price slightly above CLC’s Php5.5. Both firms also saw small gains on October 9, a day after the sale of bidding documents. However, when NOW Corp. sued the NTC over bidding provisions on October 9, its stock prices began to fall by 40 percent to Php4.36 on October 11. It slightly rose again over the next few days but continued to drop starting from the last week of October. As of November 7, NOW’s prices have plunged to Php2.25, a 69-percent decrease from its prices in October. Meanwhile, CLC’s stocks have been trading well since October, even closing at Php8.5 apiece on November 7. Since October 1, CLC’s prices shot up 55 percent. The same movements are reflected in the intraday trading of both companies on November 7, the day of DICT’s evaluation of bidding documents. While NOW’s stocks fell, CLC’s shares was rising as early as 10 a.m., or when the inter-agency committee started the selection process.